[V Report Plus] Why did 3 members of Stray Kids stray out into the cold? 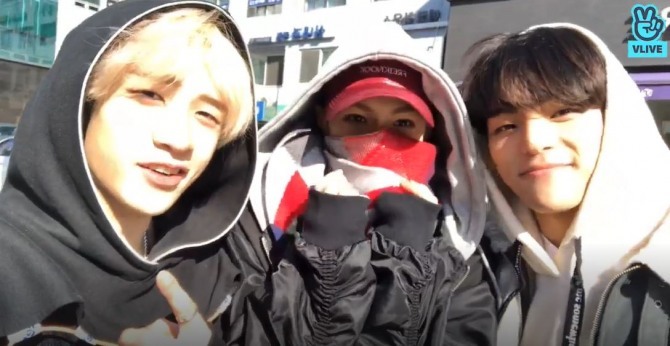 Bang Chan, Felix and Woojin of Stray Kids went on V Live on Monday afternoon, letting fans know they were straying out into the cold weather but not saying why. Felix addresses fans in a scarf and hoodie, saying he’s alone on the road in the freezing-cold weather. At the end, Woojin sings the popular Korean children’s song “Because of the Cold Winter Wind” as the others hum along on the way to their destination, where the rest of the band is waiting. “It (must have been) really cold since Felix’s finger was red,” another fan wrote. The musicians will reveal the reason for their cold-weather trek later. Watch the video at https://www.vlive.tv/video/112606.